Celebrating their 10th anniversary this month, Bingo Mania was founded in 1999 and is one of the oldest online bingo rooms in the industry. Bingo Mania is owned by Helix International and is licensed through Antigua and Barbuda. You can find a large variety of games available at Bingo Mania that will fit the needs and tastes of all players. They are ranked in the top three best online game sites in the world. Are you enticed to see what they are all about? Then come in and find out why Bingo Mania is the top in its game. 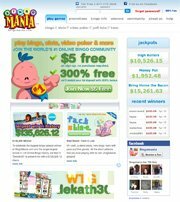 Bingo Mania is one of the few bingo rooms on the Internet, who still allow American players to participate in their variety of games that are available. Bingo Mania offers a variety of games that include 75 and 90 ball bingo, which suits every preference of the customer. Players can also play slots such as Wild Cherry and Karat Crazy, video poker games such as Keno, and Pull Tabs. Members have the option to participate in chat games, tournaments, and progressive jackpots that are available. Some of the prizes that are offered at Bingo Mania include progressive jackpots, special promotions such as their anniversary games which equal to around 8 million dollars in total prizes each month. Players can also win cash prizes while playing one of their video poker games, their slots and progressive slots, pull tabs, and so much more. At Bingo Mania, everyone is a winner. Players at Bingo Mania can purchase their cards for around a penny a piece on up to $5 per card for their Super High Roller games. Bingo Mania is powered by Parlay Software, which gives players the opportunity to enjoy their favorite bingo variant on their Internet browser. This is also great for Mac and Linux players because most browser software only requires the ability to download adobe flash. Members can contact customer support 24 hours a day, seven days a week by telephone and email. They have a great turnaround time for answering customer inquiries. Bingo Mania also offers an in depth FAQ's page to help customers answer their frequently asked questions. Bingo Mania offers their members several deposit options, which include Neteller, Moneybookers, Visa, MasterCard, EWalletXpress, and Instadebit. Currencies are available through US dollar or Great Britain Pounds for all players. Members can withdraw funds through Neteller, Moneybookers, Instadebit, and EWalletXpress. Players must make a minimum deposit of $20 at Bingo Mania and can withdraw a minimum amount of $50.